Are you struggling to make buying choice between Nikon D7000 and Nikon D7100? Or you are looking to upgrade your old D7000? This buyer’s guide will help you make an easy choice and it’s custom tailored for your specific photography needs. Enjoy the post and don’t forget to leave your opinion in the comments. The Nikon D7000 has excellent performance for its class. It is an enthusiast DSLR with a very good dynamic range in JPEGs and excellent in RAW files. It is very responsive; it produces great image quality in almost any shooting situation, including low light. It has a lot of high-end features in a compact body. It is small and light but a solid build camera that moves really fast. Above all, it’s very effective and quiet even without using its quiet mode. It also has a fantastic autofocus system. If the subject is still the D7000 locks the focus, but if the subject is in motion, the camera tracks it. A lot of cameras have the problem with focusing, but on this one, it really works perfectly and that is one of the biggest stand-out features of D7000. This is an excellent DSLR for experienced shooters who are looking for a relatively cheap camera. Fast-shooting, well-designed camera, Nikon D7100, is really comfortable to use. It has a very good dynamic range and tonality, and it performs really well, which is what you expect of the camera at that price. Externally, it is a well-designed camera with a fluid shooting design. It’s not too big nor too small and it feels solid in hands, but the front of the camera is a little crowded. Overall, the Nikon D7100 is a great fast-shooting camera with great image quality that produces really sharp, stunning images and it’s comfortable to use. Nikon D7100 as the newer model has some better specifications, but let’s go through and take a brief look at how these two cameras stack up in each category. The Nikon D7100 has a high-resolution 24.1 MP sensor, while the D7000 has a 16.1 MP sensor. The pixel size is also the differentiator of these two cameras. The D7100 has a slightly smaller but newer generation sensor EXPEED 3 which allows a higher throughput and image processing, while the older model has an EXPEED 2 sensor. The clear winner in this category is the Nikon D7100. Both D7000 and D7100 have the same native ISO range of 100-6400, but while the D700’s high sensitivity range is fixed, D7100’s can expand up to ISO 25600. Also, the maximum effective ISO score of D700 is 1,165, while the D7100’s is 1,256. This is a clear win for the newer model, Nikon D7100. With its 169 autofocus points, Nikon D7100 has a lot more control over focus than the D7100 with only 39. With more AF points it is easier to detect and track your subject so the prize goes to the Nikon D7100 in this category. There is a slight difference between these two Nikon models in this area. 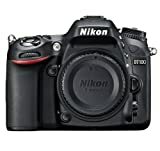 The Nikon D7000 has a 3 inch LCD screen with the resolution of 921,600 dots, while the size of D7100’s screen is 3.2 inches with the resolution of 1,228,800 dots. A narrow win for the D7100 in this category. There is also a difference in video mode. Both cameras can record HD videos which are the resolution of 1920 x 1080 but the D7000 shoots them at 24p, while the D7100 does the same thing at 60i. This has to go down as a win for the Nikon D7100. Since both Nikon D7000 and D7100 are just about the same size (5.2 x 4.1 x 3.0in and 5.2 x 4.2 x 3.0in), neither camera has an advantage in this category. Therefore, it is a tie. Although it makes the undesirable shades when being used, built-in flash might be useful in low light situations and for night shots. Luckily, both D7000 and D7100 have it, and with the same range of 12m (39.4 ft). This is another category with no winner. When choosing your interchangeable lens camera the number of available lenses can be a big decision factor. Nikon D7000 and D7100 have the same number of native lenses available and currently, that is 275. However, since neither of the bodies has a built-in image stabilization it would be good to have lenses with Optical stabilization feature. Currently, there are 86 lenses with image stabilization for both cameras. Once again, it is a tie. Attaching a microphone is an advantage for video shooting because that way we prevent any AF motor noise from appearing in our recording. Luckily, both D7000 and D7100 feature this option, so it has to be a tie again. In the world of sports photography or any kind of photography where you want to catch the motion you will find fast continuous shooting is more than useful. Both Nikon models have just an average burst mode of 6fps, but if you aren’t a professional sports photographer this can be just enough. This category also has to be a tie. If you think this isn’t important, try having a shooting far away from any power source with a camera with a low battery life. There is nothing more annoying than having to charge your battery several times during the shooting. That’s why it’s really great that both cameras have long battery lives, but Nikon D7000 comes out ahead with a life of 1050 shots compared to the D7100’s 950 shots. A clear win for the D7000. When it comes to shutter speed, both cameras have exactly the same specs. From 30 seconds for long exposures and blurred motion, to 1/8000s for freezing any motion in front of the camera. It looks like this is another category without a winner. Let’s be clear, neither camera is light weighted so there isn’t a great deal to separate them, but a slightly lighter (43.5oz to 43.1oz) Nikon D7100 takes the prize in this category. Both D7000 and D7100 have the full 100% viewfinder coverage which makes it easier for photographers to compose the image correctly when capturing the photo. With no difference in this category, it has to be a tie again. For good portrait shots, it’s really important to have large, high-resolution sensors that provide shallow depth of field and blurry background. With that in mind, we can see that the D7000 can serve the purpose but D7100 is actually an excellent candidate for this type of photography. Face detection focusing is really useful for street photography because while you focus on framing and other adjustments of the photo, the camera can do the focusing for you. Also, being able to choose whether you are going to use an optical viewfinder or live-view is a great thing in lots of different situations. Speaking of different situations, the articulating screen is something that gives you the flexibility to shoot from any position. Having all those features, both cameras are good candidates for street photography. The only problem can be the size of their bodies, but if you are used to shooting with large cameras, this won’t be a problem for you. What we need for sports photography is a fast camera. Fast shutter speed and continuous shooting are necessary along with the high number of AF points. Both D7000 and D7100 have a fast max shutter speed and the same average continuous shooting which makes them both fine candidates for this type of photography. However, with the higher number of AF points, the newer model D7100 has an advantage over the D7000 with 39 (which isn’t bad at all). For daily photography, we need a small and light weighted camera because it isn’t practical really to carry something heavy around for days. With that in mind, we have to say that neither of these cameras is a good candidate for daily photography. To capture a perfect landscape, first of all, we need a large sensor that provides high pixel quality and shallow depth of field and the live view with which you can make focus adjustments more precisely than doing it with a viewfinder. Since the landscape photographs are taken outdoors you should be prepared for all kinds of weather conditions, and that’s what the environmental sealing is good for. Both cameras have all those features; the only difference is in sensor resolution. While the Nikon D7100 has a high-resolution sensor of 24 MP, theD7000 has only an average sensor resolution of 16.2 MP. Despite that, the D7000 can take fine landscape photography, but the D7100 is just the perfect candidate. As an amateur photography enthusiast, the Nikon D7000 is my first real camera. I’ve read many reviews and comments on how it’s not for someone who doesn’t know how to use a DSLR and that proved to be true. It has a large variety of features so I really had to study to learn how to use this camera properly, but since I’m a geek, I don’t mind 😀 Jokes aside, I think this is a fantastic camera. It takes great professional looking images and I love it! This camera helps me improve my skills every day. As a working pro, I use a lot of different cameras and I couldn’t resist trying out the Nikon D7100. My first impressions are very positive. Ater my initial setup in the menus I was impressed with autofocus speed, clarity, and color of images. Flash tones are also great. This is an excellent camera, I have no complaints. As usual, better specifications come with the higher price. However, both cameras are just fine DSLR models and if you are moving into DSLR photography neither will disappoint you. Depending on what you need the camera for you should decide whether you want to spend more money or not. Lastly, after comparing the performance levels and a few technical aspects of both cameras, the Nikon D7100 as the newer, improved model, comes out as a slightly better DSLR.